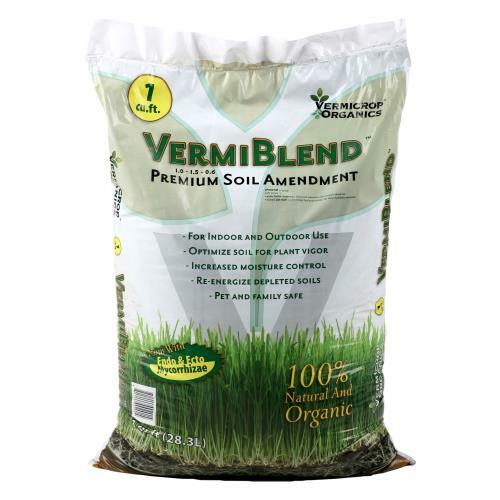 For Best Results One (1) Bag of VermiBlend™ will Amend 5 cubic feet of potting soil. For vegetable, flower gardens and all purpose applications- Apply at a rate of 1 bag of VermiBlend™ Premium Soil Amendment to a 5’x 5’ area or a 1/2” ground cover to new or depleted flower bed. NOTE: Mix into soil well. For planting mix and potting soil-Add VermiBlend™ Premium Soil Amendment at a Rate of 15% (approximately 1 bag VermiBlend to 5 cubic feet of soil). For trees and shrubs or established plants- Apply VermiBlend™ Premium Soil Amendment as a ½” top dressing around the base of the plant; work into soil and water. Vermicrop™ Organics VermiBlend™ Premium Soil Amendment was created for the organic gardener. VermiBlend™ Premium Soil Amendment has a unique blend of earthworm castings, compost, fossilized kelp, humus, rock minerals and mycorrhizae to provide ample amounts of micro nutrients, trace minerals and beneficial microbes.